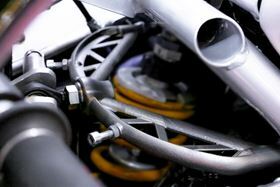 A titanium wishbone made using AM forms part of the front suspension system. Additive manufacturing (AM) company Renishaw has renewed its sponsorship of the French Moto2 team, TransFIORmers. In partnership with I3D Concept and Renishaw, the team has used AM to improve the performance of its Moto2 bike. Renishaw first sponsored TransFIORmers in 2016. TransFIORmers says that it is the only Moto2 team to use AM to produce a structural component for the bike – a titanium wishbone which forms part of the front suspension system. The team has achieved a 600 g weight saving on the part. ‘Following the success of the wishbone, we are now designing more and more parts to be additively manufactured,’ said Jérôme Aldeguer, mechanical engineer, TransFIORmers. ‘Not all parts can be made in titanium, so we are looking to alternative materials to manufacture brackets, footrests, a chain tensioner and other essential parts of the bike.